Though the national stage for boxing has only seemed to grow smaller and smaller over the years Hollywood's infatuation with the sport has only grown stronger. Between Southpaw and the generally terrific Creed last year to Hands of Stone and now Bleed for This the question around the story of Vinny Pazienza was always going to be not what made it worth telling-we know what the hook is-but more what makes this film in particular worth watching as the options for such sports dramas are continually growing. One could go on to discuss the committed and rather spectacular performance that Miles Teller gives in the role Pazienza, or the cool aesthetic that matches the time period in small, effective ways, but despite the casts best efforts and writer/director Ben Younger's endeavor to paint more a portrait of a man determined to overcome the odds rather than going through the motions of another redemptive sports tale, Bleed for This unfortunately ends up reducing itself to just that. It's a difficult place to be in as the genre trappings of such a film are so familiar and so easily relied on at this point that it is difficult to conjure up any such alternate as to how to go about telling such a story. Younger clearly has a knack for visual storytelling and each of the performances on display here, with the supporting turns from Aaron Eckhart, Ciarán Hinds, and Katey Sagal standing strongly next to Teller's lead performance, are far more than competent and in fact add heavily to the overall arc these characters experience allowing them to not just remain stock characters. This is key as it's always the characters who are going to allow pieces like this to stand out. Younger and his cast are able to create fully realized human beings who come across not as functions for the purpose of this movie or who are only present to further certain plot strands, but instead as individuals who have found themselves in the circumstances of this dour situation who are each trying to figure out how best to deal with it. Sounds rousing, right? Maybe even inspiring? It certainly could be as Bleed for This has all the right moves to make it a cornerstone boxing movie, but pacing issues and a lack of any heavy emotional impact leave this one stranded in the middle of the ring. Vinny Pazienza (Miles Teller) transitions from lightweight champion to middleweight champion before suffering a broken neck as the result of a serious car accident. If you're unaware of what the "hook" is that was referenced earlier it is the fact that boxer Vinnie "The Pazmanian Devil" Pazienza was involved in a serious car accident that broke his neck with doctors telling him he would never fight again. It is widely considered the greatest comeback in boxing history and thus it was inevitable that a feature film version would one day be produced around the events. It's certainly a hell of a story and Younger, a director who hasn't made a movie in over a decade, must have felt some strong connection to the story in order for him to both develop the screenplay and bring the project to the big screen. Beginning by showing us how Pazienza built quite a reputation for himself in the early eighties, even going on to secure the IBF World Lightweight Champion, though not without issue. Glimpsed in the first scene of the film at the weigh-in for Pazienza's fight versus Roger Mayweather in 1988 the focus of the scene is that our protagonist is running late for the weigh-in because he's still working to make weight. This wasn't a new issue for Pazienza at the time as he'd had frequent trouble with making weight, but after the eventual fight with Mayweather he collapsed in the dressing room from near-fatal dehydration and was rushed to the hospital. Change was clearly needed in the Pazienza camp and thus former Tyson trainer Kevin Rooney (Eckhart) was brought in and suggested the fighter move up to a more natural weight class. Pazienza was naturally hesitant at first, but decided to go for it after his promoters promised him a title fight in the middleweight division. Though Rooney was hesitant and knew the fight was only organized because the promoters backed both Pazienza and his opponent things moved forward as expected with Pazienza ultimately winning; earning him the opportunity to challenge Roberto Duran (who had his own movie about him released earlier this year in Hands of Stone) who was and still is regarded as one of the greatest boxers of all time. Before Pazienza was able to fulfill his destiny though, he rode shotgun in a vehicle that was struck head on leaving him believed to be disabled. As this is a rousing sports movie and the wreck in which Pazienza breaks his neck occurs only a half hour or so into the film it's fairly easy to deduce that our hero will not be disabled and that not only will he walk again, but he will undoubtedly step back into the ring. 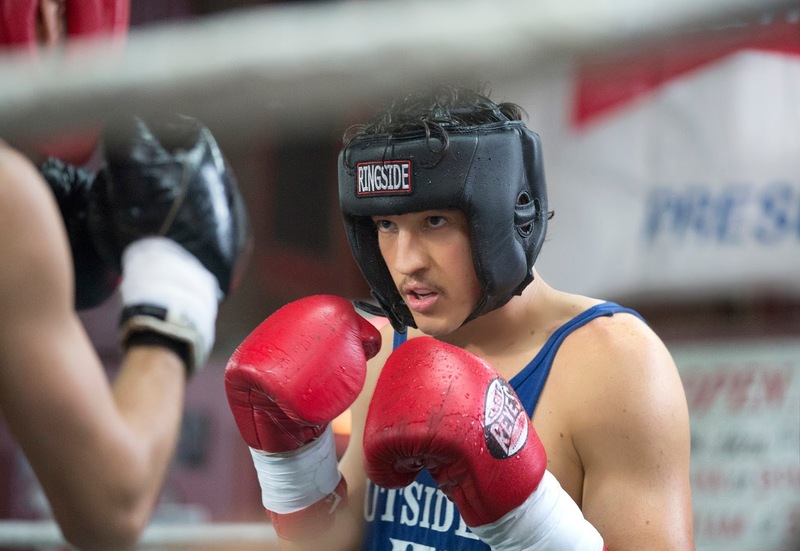 Whether or not he will be able to compete in the ring is the question that hung over this particular viewer's head as I knew little about the career of Vinny Pazienza outside of what the trailer told me prior to walking into the film. To get to the point of whether or not the audience even believed such a task was possible though, Younger was going to have to let us get to know the type of spirit Pazienza possessed. Much of this is accomplished through Teller's clearly dedicated performance, but more than anything Teller could have done it is the environment that produced a person such as Pazienza that is just as vital to how he became the man he did. With a gambler of a father (Hinds) and something of a fanatic for a mother (Sagal) it's curious to observe what their son draws from each of them that contributes to this undying dedication to a single thing that involves a thousand necessary risks in order to get to the top. It's a nice touch and over the course of the film both of Pazienza's parents resolve with somewhat affecting arcs. Boxing is Pazienza's entire world though and I enjoyed that he acknowledges this enough to not drink, do drugs, or even allow his, albeit short-lived, infatuations with women to distract him from the main objective of training and winning. Teller's commanding performance conveys all of this in one way or another though his own actions or subtle interactions with his parents, but the audience need only see one sequence in the film to know just how tough, if not stubborn, the real Pazienza was. This deals with the scenes in which Pazienza has a halo, or metal brace that is screwed into the skull in four spots, both installed and removed. The former due to the fact this isn't the recommended course of action and the latter due to the fact Pazienza doesn't take a sedative before the doctor unscrews the object from his skull. Younger gives the audience a taste of the full comprehension of what Pazienza is going through by remaining tightly focused on different facets of Teller's face that show genuine reaction to the pain. This tells us what kind of pain Pazienza can withstand though-just how much he can take without being put down completely. 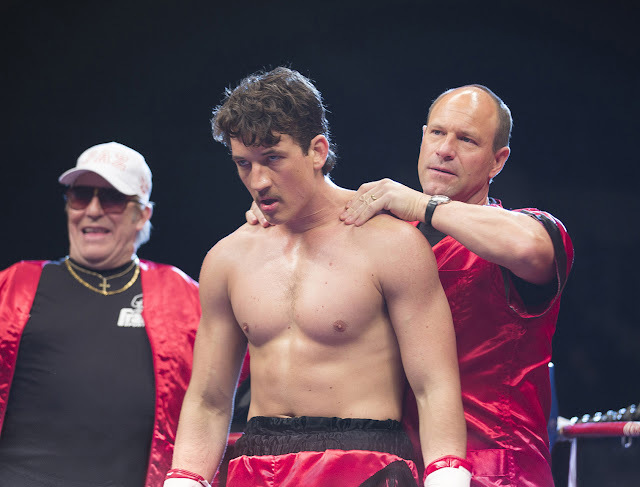 Trainer Kevin Rooney (Aaron Eckhart) preps Pazienza for his comeback fight in Bleed for This. 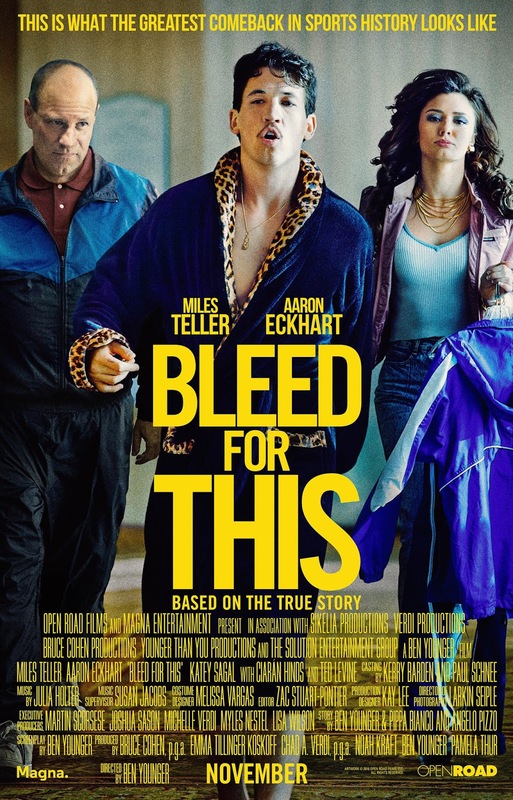 Unfortunately, for a film that deals heavily in themes of gambling and risk-taking Bleed for This plays it fairly safe. Dragging heavily in the second act, the film takes too much time between the car wreck and Pazienza beginning to train again taking us out of the investment in the character that was created in the first half hour. It's curious why Younger would make such a decision as during this time Pazienza is physically unable to accomplish anything. In spending such time with the character where many of his close family and friends are at odds with his decisions (everyone but Vinny seems to know he won't fight again) there isn't much to be gained. If there is anything this portion of the film is meant to show it's that Pazienza almost succumbs to the low point he drops to and that Rooney more or less saves him from doing so despite Rooney not believing he will ever fight again either. It makes sense to show us that out of this tragedy a bond was born between a fighter and his trainer that would push him further than he ever thought he might be able to go, but by spending so much of the running time on mostly tepid endeavors the film not only loses control of its pacing, but forces the third act to have to rush through the underdog act that it also feels obligated to play out. That said, once Pazienza begins training again and the chemistry between Eckhart and Teller reaches levels of real charm it's difficult not to appreciate the performances these guys are putting on. As Teller is the star of the vehicle it's impossible not to acknowledge the fact the actor completely inhabits that of the nature of this man even if the cocky alpha-male is in the actor's wheelhouse, but the MVP here is easily Eckhart as he makes an immediate impression through his quick wit and even quicker character assertions-this and his dance moves are worth the price of admission alone. Bleed for This does sport some fine editing in the final round of the last match we see on screen when Pazienza finally meets Duran as the sound drops out and quick flashes of all that have pushed our protagonist through to the last three minutes of this fight, but as rousing as such may be and despite the fact everyone loves an underdog it all feels too little too late in a film that tried to do too much with a simple story inadvertently making it not nearly as grand as it seems to think it is.